"Today bring to Me all mankind, especially all sinners, and immerse them in the ocean of My mercy." Perhaps you've tried everything to draw your friend or family member back to faith in God. 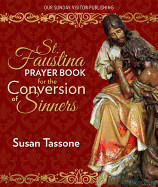 In St. Faustina Prayer Book for the Conversion of Sinners, best-selling author Susan Tassone shows you how to place the lives of all you love into God's merciful hands. Known worldwide as leading the "purgatory movement," Susan invites you to learn how to live the message of conversion daily, to avoid purgatory, and to become more faithful in praying for others.